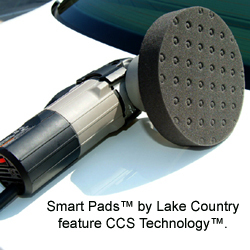 Smart Pads™ Professional Foam Pads were created through a partnership between Palm Beach Motoring Accessories and Lake Country. As many detailers know, Lake Country is the maker of the industry’s finest foam pads for polishers and buffers. With their reputation of excellence, it’s no wonder that we wanted their input when creating premium foam pads. The German automotive care industry is responsible for many of the modern breakthroughs in surface enhancement. They were among the first to explore engineered polymers and apply them to car care. Now, they’ve engineered a foam composition that is remarkably resilient, durable, and effective even on today’s hard, high-solids and ceramic paints. Smart Pads™ foam is as suitable for high speed rotary polishers as it is for dual action models. That’s because the foam withstands the heat and friction generated by the polisher without transferring it to the paint. This European foam minimizes the risk to the paint while giving you expert results. In the fall of 2006, Lake Country introduced CCS Technology. CCS stands for Closed Cell Structures. These are pockets of closed foam, where products are less apt to soak into the foam. The CCS pockets act like small reservoirs for excess polish or wax. When more product is needed on the pad’s work surface, it is drawn up a center column of open-cell foam within each pocket and distributed back onto the work surface. CCS Technology prevents foam pads from drying out and reduces product waste. We incorporated CCS Technology into Smart Pads™ to create the best combination of pad design and foam composition available. The third major component in Smart Pads™ is shape. The pads are shaped to maximize results with minimal risk. The 7.5 inch and 8.5 inch pads feature a curved edge and a protective lip to prevent the backing plate from touching the paint. The backing plate sits within this lip. When using a circular polisher, the Smart Pads™’ premium imported foam, curved edge, and protective lip allow you to get professional quality results with minimal risk to the paint. The 4 inch, 5.5 inch, and 6.5 inch pads have a flat polishing surface so you get the most pad-to-paint contact. When working with a dual action polisher, the orbital and rotational motion of the pad maximize the benefits of working the pad flat. Velcro® brand hook and loop fasteners stretch from one edge of the pad to the other to provide a secure connection to the backing plate. The professional grade foam and cutting edge CCS design of Smart Pads™ offer dependable results for professional detailers and user-friendly operation for hobbyists. All Smart Pads™ use VECLRO® brand fasteners to secure them to the backing plate. Click on the pads and kits below for detailed descriptions of the pads and their functions.